Hotel las Américas is an idyllic place, an atmosphere for adults over 18 years of age with direct access to Varadero Golf Club, in Varadero, Cuba. It is a hotel for enjoying relaxation and sport, without forgetting an exquisite culinary adventure and meticulous service so that clients enjoy an unforgettable experience. For this project, the selected KRION material was L501 POMPEI, belonging to the LUXURY series, a series which brings us the beauty of nature with its finishes which provide the sophisticated appearance of natural stone. 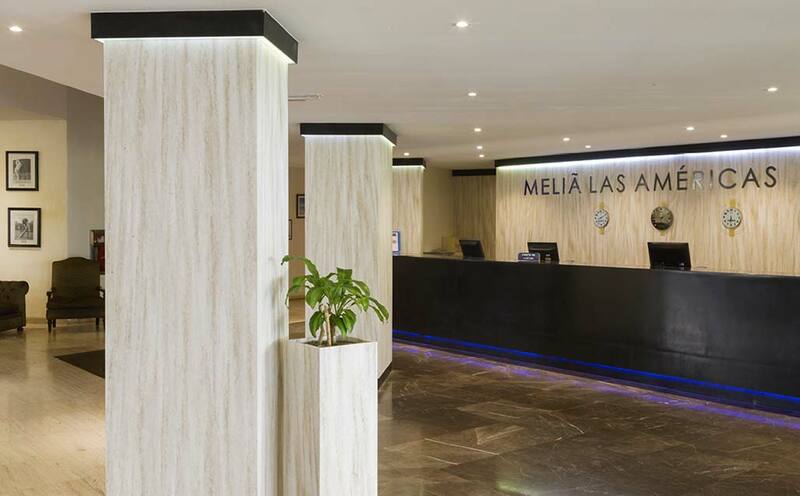 In the case ofHotel Meliá las Américas, we find the solid surface from PORCELANOSA Group in its highest transit space, the lobby. Here our material L501 POMPEI demonstrates its versatility and translucency, created with a base colour of cream and transparent chips, decorated with veins of different tones from brown to white, which the hotel has taken advantage of both with and without illumination on the coverings of walls and columns. We can also find KRION in its 7904 Black Star format in the hotel reception. KRION transformed by: Impexic, S.L.